The iSpring bundle is an amazingly comprehensive and integrated suite of elearning tools, including a learning management system, screencast and video creation, rapid authoring and more. 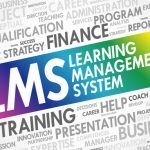 This review focuses principally on the LMS at the centre of the iSpring elearning tools – iSpring Learn. iSpring has been incredibly successful in the USA, so I was keen to understand quite why this is so and took the time to find out. 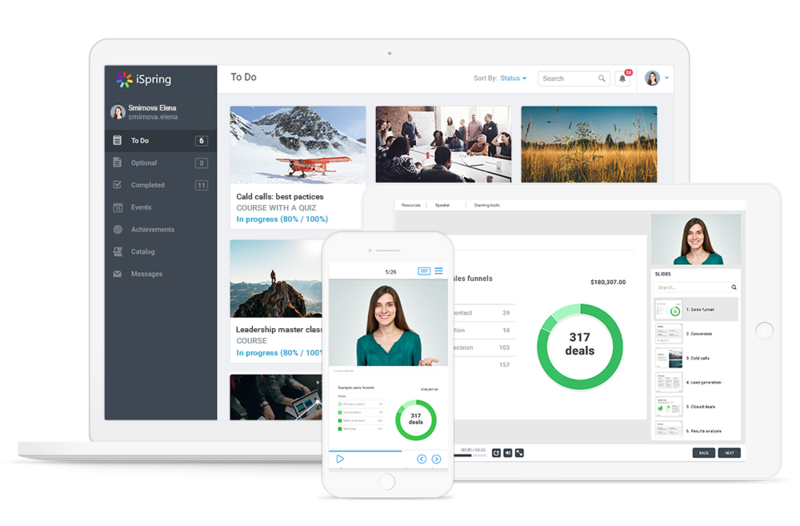 the iSpring Learn LMS, with the integrated authoring tool, allows L&D professionals to start simply but then quickly to become sophisticated elearning aficionados. In summary, there are several reasons: from an effective and engaging interface, a well thought through focus on helping trainers create and deliver great learning and really thorough reporting. However over and above everything, iSpring offers learning and training professionals a solution that starts simple but is capable of supporting them in delivering really quite sophisticated elearning and blended learning programmes (classroom and webinar) and can go all the way to gamification. 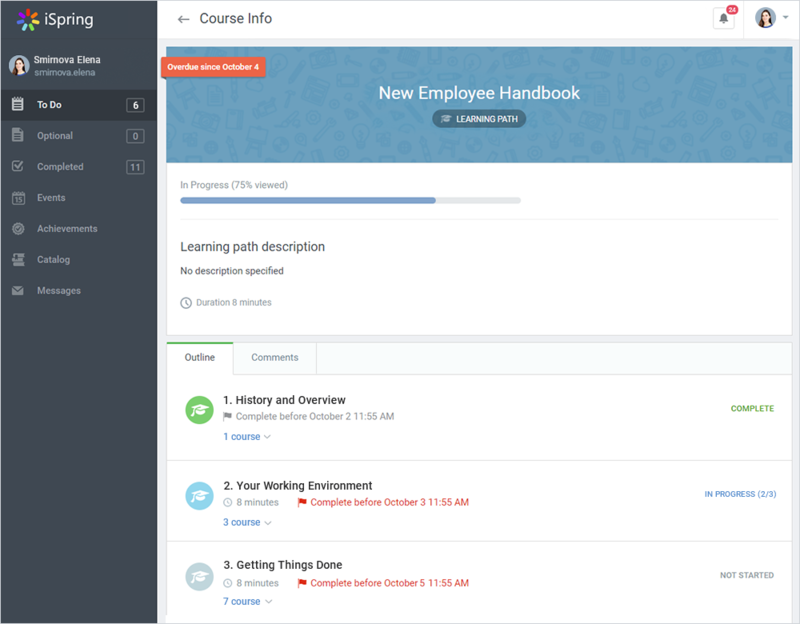 Beginning with the learner’s perspective, this is a good looking LMS with a very neat and clean User Interface (UI) that is using a Netflix look with an informative interface designed to provide as much information for the learner and as few barriers as possible for that learner to dive in and get learning. 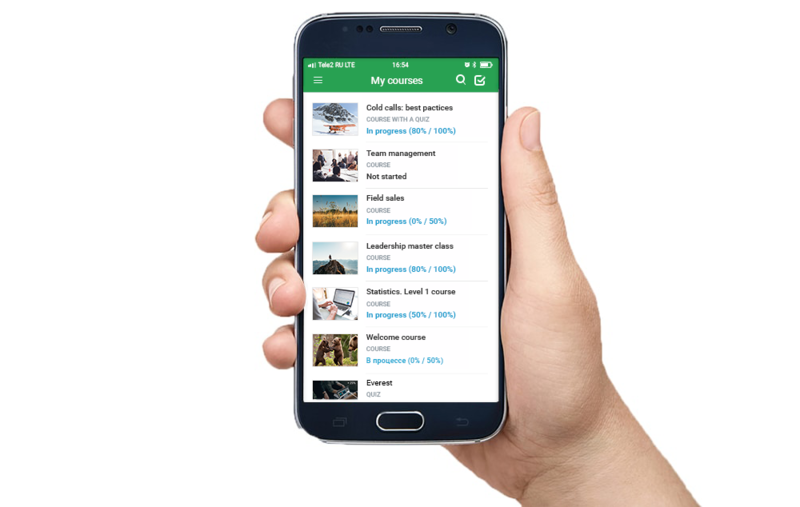 Presenting an intuitive interface sounds easy, but the precision applied to the interface design is considerable and the results are impressive and I have no doubt that iSpring Learn LMS will deliver excellent levels of learner engagement due to its crystal clear UI and UX. The native mobile learning app is well designed and very intuitive. Notifications from the LMS are delivered within the App which is useful and for desktop users iSpring is about to launch in browser notifications as well, even when not logged in a learner will therefore be notified by the LMS. Useful. Catalogues of optional learning are available as well as defined learning pathways (more below) and learners are encouraged to create their own learning to do lists in their own portals. The Native app supports the catalogue and building to do lists as well as leader boards from the gamification feature. 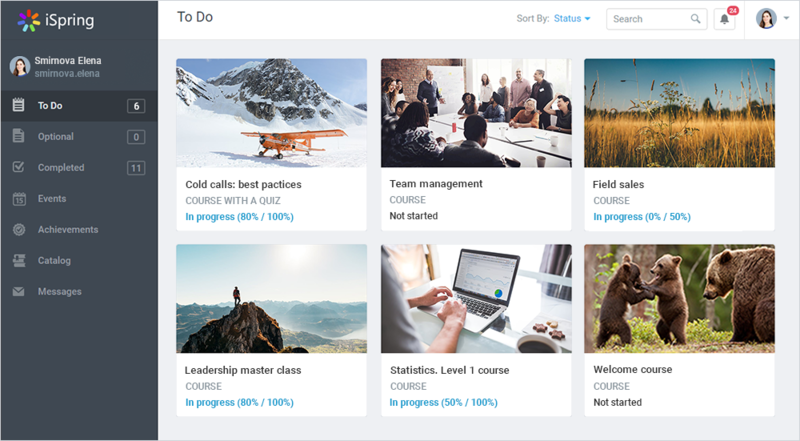 Behind this engagement interface, iSpring Learn is a very sophisticated LMS designed for training professionals to create and manage elearning courses that can be as simple as required or as comprehensive as desired. Doing each is actually remarkably easy. It is however the creation of learning pathways which is this LMS’s core raison d’etre, and at which it is quite excellent. For the training professional in an organisation the options and techniques to create flowing learning pathways that drive learner engagement and results are there and iSpring really does make it quite easy. Clear concise menus and metaphors abound, but they are intuitive and easy to grasp. Clearly a great deal of thought has gone into the design of iSpring Learn. There is the ability to create workflow that offer managed pathways and self –directed pathways. I particularly like the Expert feature… in which a nominated expert can be appointed to be able to handle private queries as part of the course progression. Learning interactions in the pathway are nicely designed in. 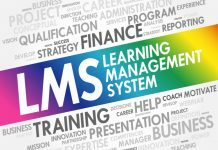 I am particularly taken as how reporting is so well incorporated in the learning pathway design process and is certainly not an afterthought, which is too often the case in many LMS I come across. Here reporting is thought through and comprehensive. It is fair to say that to get the best from iSpring Learn and the learning pathways in particularly from a content perspective it is best to use the iSpring Suite in creating content. This allows for very tightly integrated content delivery, including SCORM 1.2 and SCORM 2004 and pretty much any other file format you care to name. The iSpring suite addresses xAPI effectively as an option. However, one key reason for the success is how iSpring integrates with PowerPoint. 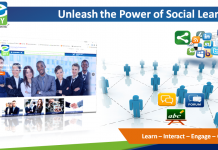 So, for many trainers embarking upon the digital learning journey the strength and attraction of the iSpring Suite is its ability to leverage PowerPoint. PowerPoint can be uploaded directly into iSpring Learn where it can become quickly and easily really very engaging and effective e-learning. Using other components such as iSpring TalkMaster, QuizMaker, CamPro and Visuals means that easy to create content can offer excellent production values. 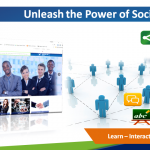 There is a lot to like about PowerPoint as a powerful yet cost effective e-learning development environment when leveraged by the iSpring Suite. I know it is cool to disrespect PowerPoints, but the power of PowerPoint to create and increasingly embed learning assets should not be written off. PowerPoint can be used to create in context learning content quickly by training professionals and when needed it is a really good tool to use. I would add iSpring Flip is a neat tool to turn PDF’s into e-learning as well. This has many benefits for training professionals, there is no real need to learn new skills if you are a competent PowerPoint user. Naturally this makes life easier and saves time and money…and crucially in my view keeps a team of training professionals engaged in an e-learning project as organisations migrate from the classroom to on-line learning solutions as iSpring Learn is at home managing classroom learning as well as webinars. Catalogues or courses are also easy to create to allow for a more self- directed approach. Creating assignments as part of the learning pathway is well thought through and learners can upload files (pretty much every file type is supported and with browser based uploads there is a 2GB limit, PowerPoints though have a 4GB limit) in evidence of their completed work, this solution is easy and intuitive to use. 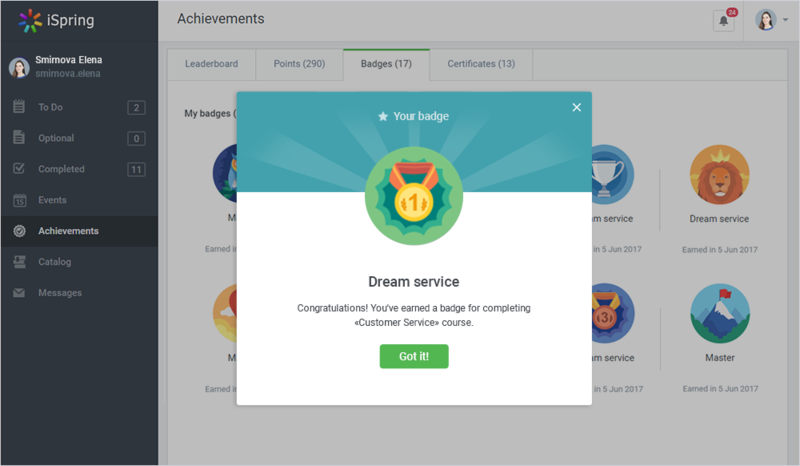 Gamification is built in along with badges and the whole concept of supporting engagement and rewarding achievement is well thought through and designed, from leader boards, points and badges and of course driving out to certificates. Again this modality of engagement has been carefully thought through by iSpring to be easy to use. 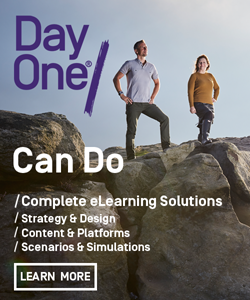 However, I always make the point in the world of Gamification, while it is easy to use…….L&D professionals must think through what they are seeking to achieve….so please do not use gamification techniques because you can. iSpring makes it easy and I would always suggest some experimentation first to ensure you are getting the desired results and yes, iSpring makes this easy as well. The learner portal is well designed and can cater for self registration (with domain limitations naturally) or enrolments. As we noted above a catalogue option is available. The LMS can also allow for e-commerce led transactions as well. 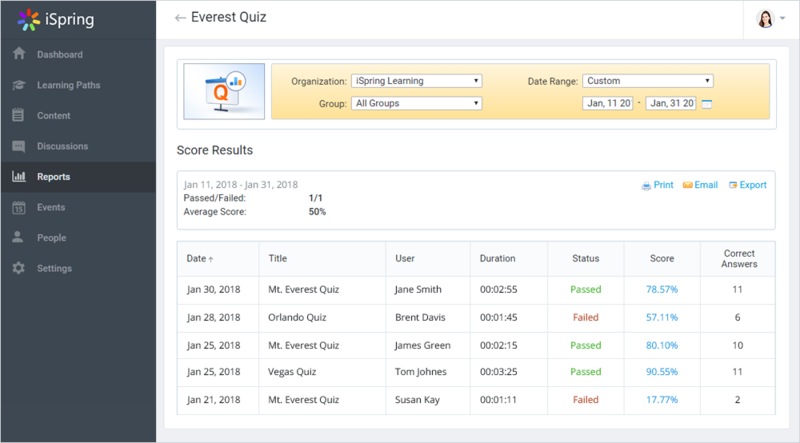 Understanding the impact of the e-learning is very well catered for and iSpring offers what is termed Fluid Reporting, I particularly like the multi-view reporting. As the learning pathway is being built out, fluid reporting is being built in as part of the design process. This is really very neat indeed and engenders a level of thought in the process of creating pathways that sets meaningful measures at the content level that reflect the purpose of a learning programme. iSpring takes us beyond simple pass and fail without undue complexity. Learner admin is pretty solid. With lots of options to communicate with learners by e-mail and alerts. LMS administrators can allow for a good number of hierarchies (5 roles are allowed for) in additions provision is easy to make for reporting and learner management in differing organisational groups and team structures with what I would term “groupage hierarchies” beyond the roles. The learner interface of iSpring can be configured into a wide range of languages. The admin back end is in English only. 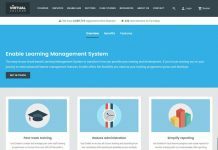 iSpring has a capable open API covering (add and manage learners, edit, profile assign, un-assign and reporting) and supports a wide range of SSO protocols (4 can be used). 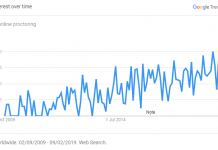 Cloud hosting (from one of the world’s largest providers with servers located all over the world) is used, so SLAs and site performance is excellent and crucially with no data restrictions. Browser compatibility has been well tested and the LMS is fully mobile responsive. 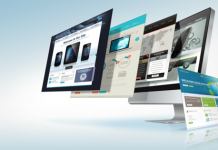 The LMS can be designed and branded with a good set of options and a while label URL provided as well. Pricing is interesting and transparent and as a SaaS platform based on active users. This makes for a cost effective solution. I am impressed by the archiving solution in particular and how users can delete learner and recover learners if required. 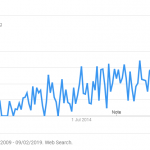 This can have a useful impact upon pricing as well as offering a useful audit tool. Support is by e-mail and ticket and there are no imposed support time limitations, beyond a fair use policy. iSpring offer a 24 hours response and covers all time zones as standard. 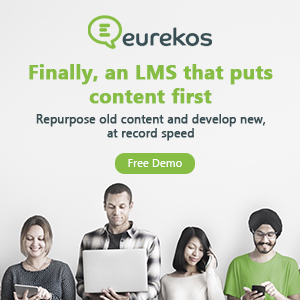 An LMS for L&D professionals to start easily and simply and before they quite realise it they can be producing and sharing top quality e-learning quickly and easily. iSpring Learn is feature rich, easy and intuitive to use for L&D professionals and engaging and effective for learners. I understand why it is such a popular choice in the USA by L&D teams with Blue Chip organisations such as IBM, Microsoft and Tesla. The iSpring Learn offers a powerful solution for training teams and training companies. I would advise giving serious consideration to the iSpring Suite for excellent content creation capabilities with its modular component set, it offers tightly integrated content where L&D professionals can be assured that content created in the iSpring Suite will work with great effect in iSpring Learn. All in all, an impressive LMS. Read more about iSpring Learn on their website and arrange a free trial or live demo.